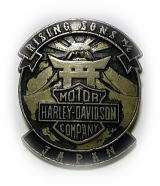 Rising Sons Motorcycle Club was founded during the 80’s when American serviceman stationed at Yokosuka Naval Base and Japanese living in the surrounding area, started a club based upon their mutual passion for Harley Davidson’s. Our goal is to contribute to society through community involvement programs, such as sponsoring a local orphanage, as well as being involved with biker events throughout Japan. Copyright(c) 1987-2017 Rising Sons Motorcycle Club. All Rights Reserved.